I love Maltese Bichon puppies and this little guy melts everyone's heart. His look with the puppy face is irresistible. His adaptability and social skills are wonderful. And most of all he is very loving. We got our Maltese Bichon puppy last week when he was 12 weeks old. On his first day with us, we introduced him to a dog park where small size dogs get together. He was nervous because he was separated from his litter and my husband I were still strangers to him. One week later, we visited the park again. He was a completely different dog. Since he now has a strong bond with us, he feels secure and confident. He acted as if he owned the park. He grabbed any dog's leash and pulled as if he was in charge. His playful body language melted everybody's heart at the park. People exclaimed, "You are so cute." I was concerned that he might think his name is "Cute." When he sleeps with us, he always wants to feel the contact with us. He puts his nose under our armpit or neck and even sleeps cheek to cheek with us. No doubt that he will be a wonderful companion in our lives. Questions to Maltichon owners: Will my dog keep the same look without having long ears? I saw some Maltichon with long ears. I wonder whether his ears get longer as he grows. I'm a maltichon and 9years old. my mom keeps my ears clipped so I have kept my look all my life. the other dogs with the long ears probably have not had the hair cut on the end of their ears. You are soooooooo cute. My baby Lily is the best! 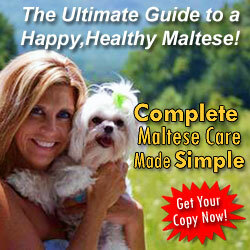 She is one of the sweetest, most loving little Maltese Bichon puppies. She is so friendly to all kinds of dogs and people. I socialized her from day one and her BFF's are a pug and German short-hair. She is litter trained and had run of the house since she was about 7 months. Not that she doesn't like to get into things, but I keep the house pretty puppy proof. She is 10months old now and weighs about 8lbs. I groom her myself and like to keep her a little longer. 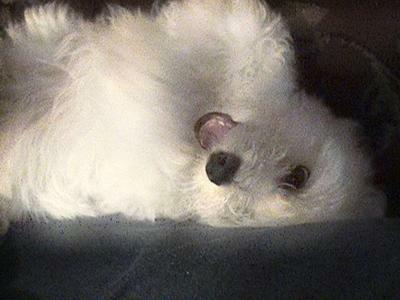 My Maltese Bichon puppy is hilarious the way she races around and is famous for her kissing. She is completely adorable and such a joy. Hi- I just rescued a little girl that looks just like your lily! My question is how do you keep her eyes so clean? Lily is certainly a cutie. She has a common type of friend. We have a German Shorthair, Lady, who thinks she is a lapdog just like Muffit who is a Maltese/Yorkie mix--a Morkie. Muffit is 6 mos. old and weighs about 7 lbs. These two dogs are as goofy together as they come! It's just a good thing that Lady has the gentlest mouth. They tease each other constantly with their toys and bones and people. I have a picture of Lady and Muffit both on my lap all curled up together!! 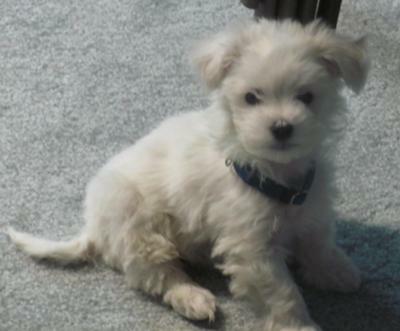 We just adopted one of the most special Maltese Bichon puppies, Bentley, from a friend on 3/21/2010. We were not in the market for a dog at this point in our lives. We have very active kids both in school and in sports. However, the moment we seen him, he won our hearts. He is 10 weeks old and one of the most friendliest, loving and playful dogs we've ever owned. He is also one of my cutest dogs too. He is great with our kids and all our guests too. 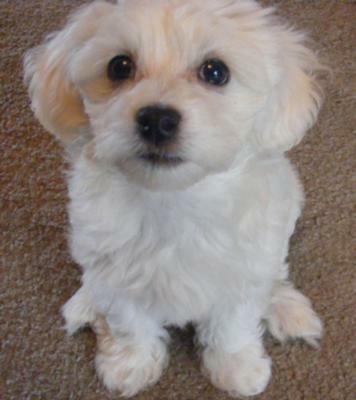 Our Maltese Bichon puppy is really smart and has already taken to potty training (I think). We can't take all the credit for that, our friends had already started training him before we adopted him. We think he's special because his mother developed Preclampsia while pregnant and after delivery was to sick to nurse. He and his four other brothers were bottle fed. Three of them eventually died. He was the runt of the litter but managed to live and become the little guy he is today. Where did you get Bentley? 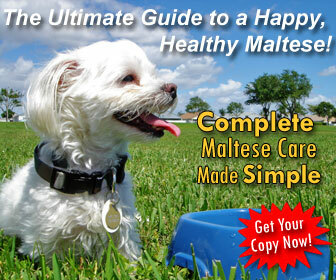 I just lost my Maltese Westie Charlie and am looking for a dog like Bentley. I live in Abon Lake and was wondering where you got him? That is such a sweet story. It's really SAD as well. But he had a purpose, and it was to bring happiness and love to your family. He is ADORABLE!!! I would have bought him too. How could anyone say no to his face?! Good Luck and Congratulations to you all and him! Bentley is very lucky to have someone like your family to adopt him.And you & your family are lucky he made it to this point.I think he is very cute. 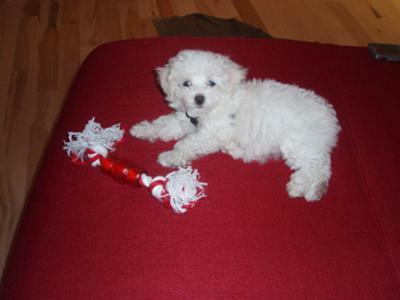 I'm the proud owner of one of the most beautiful little Maltese Bichon puppies called Milly. Milly is a little bundle of fun. She loves when I groom her every evening. Milly is so affectionate she loves cuddles and she was house trained by eight weeks. If your considering getting a Maltichon I would highly encourage it they are great little dogs that don't shed at all. They like lots of love and attention so are suited to a house where they'll have company most of the time they make great little companions, are great with children and they are very loyal. Maltese Bichon Frise puppies are also very intelligent and learn commands and tricks fast and love showing off and being rewarded for it. 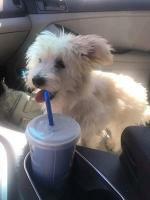 Miko is 11 weeks old and one of the most awesome little Maltese Bichon puppies! He is very outgoing, affectionate, intelligent, playful, cuddly, fearless and feisty. Miko has been easy to train and learned "sit", "stay" and "fetch/drop it" by 8 weeks old. 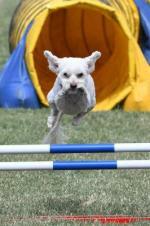 Our Maltese Bichon loves being outside and playing with other dogs. He seems to love everyone - people and other dogs included. We feel so fortunate to have this amazing little dog in our lives. Maddie is 10 weeks old and one of the smartest Maltese Bichon puppies. I've had her about two weeks and she is ALREADY toilet trained and responds to her name. The second day I had her she did a 5km walk and would not be carried at all, then she came to a 3 hour movie with me, and was very quiet, just slept on my lap the whole time (probably from the walk). She sleeps in the bed next to me at night, and is very very affectionate. She gives little kisses with the end of her nose and even loves to play with our foxy dog and cat, who are both about 4 times bigger than her. She goes to the office with Grandad in the morning and plays with his sandals until she naps. 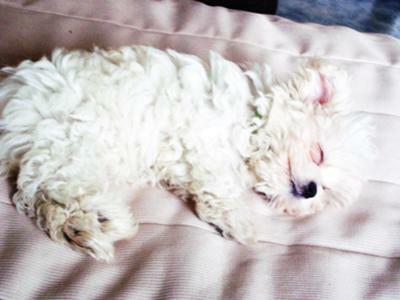 My Maltese Bichon puppy is very cute, full of energy until she thinks one of the animals will beat her in a play fight. Then she plays dead, which is hilarious to watch! I got one of the cutest Maltese Bichon puppies, my little Simi, from a pet store as I have no children at home, and my cats just aren't the same as a puppy! Simi (Sim-ee) is just beautiful and fun! I'm having some trouble with house training, but I work all day and refuse to crate her for that long. 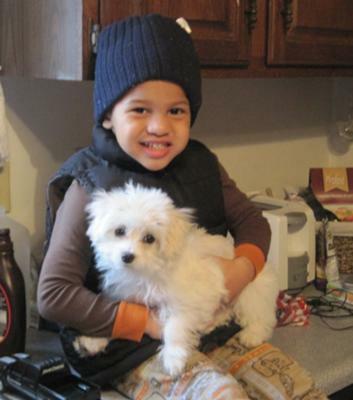 This photo is my Maltese Bichon puppy at about 4 months with my grandson, Xavier, who loves her too! My husband passed away about two months ago, I have a wonderful 15 year old German shorthair I love her very much. I thought I really needed another pet so I would have to do more instead of staying in bed many days of the week. My friend has a Maltese bichone that had two puppies that I was there for when they were born she kept telling me I needed one of the pups well I ended up with both of them Sophie and Charlie I had no idea what a wonderful gift she gave me they are just great and when they are potty trained they will be heaven. My older Mandy is teaching them to leave her alone when she eating and sleeping but she does love to try and play with them , but like me she is getting usd to small dogs. They are the best and so funny. I could not be happier with my new little ones that will be three months old next week. I had no idea something so small could bring so much love and happiness into your home. Thanks for the words of encouragement! She does go in the same spots in the house, so perhaps using paper might be a wise transition. I hope she will get there eventually! Simi is so pretty! What a lovely puppy! Does she potty on paper? My Malshi learned to do that initially but now she goes outside! You will get there soon don't worry! 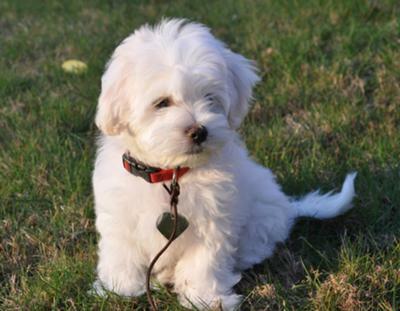 Bentley is one of the smartest Maltese Bichon puppies. He is 13 weeks old and can sit, beg, lay down, roll over, speak, and fetch. He gets very excited and very hyper when people enter the house. He barks when visitors knock on the door or when barking seems appropriate. He is very affectionate towards everyone. We are having some potty training and chewing issues. But he is only 13 weeks old. Our Maltese Bichon puppy is very curious and loves his squeaky toys. He wishes that our 14 year old cat would play with him. Lucky for Bentley, the cat has no claws. How do I find out more information about Bently? 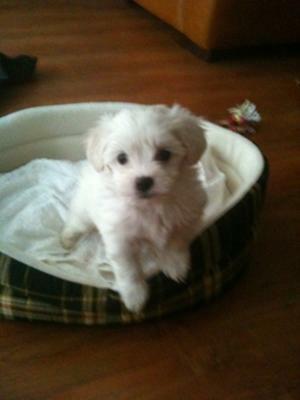 Well I got one of the cutest Maltese Bichon puppies when he was approximately 9 weeks old and he is 7 months old now. There is a little sadness to this story. I was supposed to pick him up on a Sunday and then go the nursing home where my mother lived. But, unfortunately my mother died the Thursday evening before (3 days before I was to go and pick up my beautiful Maltichon puppy). So, I ended picking him up the week after, which was right after my mother's funeral (that same day). I did meet him the first day of the wake because I stayed over the owner's house (she is my ex-sister in-law). Well ever since then he has brought alot of joy in my life. He is now 7 months old today and still brings me so much joy. He knows when I am not feeling well or sad. I am so glad I have him he has helped me heal from my mother's passing away. And, now I have some more troubling time coming, my sister has just been diagnosed with stage 3 ovarian cancer. But, I know he will help me through all this. I chose this particular name Biscuit Sucre because we are french and my mother always loved making sugar cookies (sweet biscuits) and she would have loved this name. So I want to thank my ex-sister-in-law for introducing to me the most perfect Maltichon. I got my Maltichon a couple weeks ago - she is now about 9.5 weeks. I too did this after a terrible loss of my 18 year old son from cancer. My son died a couple months ago and this is my first dog. I can't believe how much she just lifts my spirits. Take care. My condolences to you and your family. Hang tough. Great pikture!! love your pals, LuLu and LoLLy! glad you have a furry solution to some of lifes biggest woes - but your sister will be fine - my friend had the same thing and prayer and good cancer treatments work wonders and there are foundations like Ovacome that you can go to in order to learn more and more about what treatments are available to her and for her - there are tons of charitable organizations devoted to Ovarian Cancer like OVACOME - hopefully they can inform and inspire!